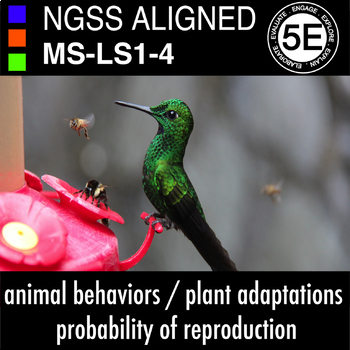 This comprehensive Middle School NGSS 5E lesson plan is designed to align with the NGSS Middle School MS-LS1-4 standard "Use argument based on empirical evidence and scientific reasoning to support an explanation for how characteristic animal behaviors and specialized plant structures affect the probability of successful reproduction of animals and plants respectively". 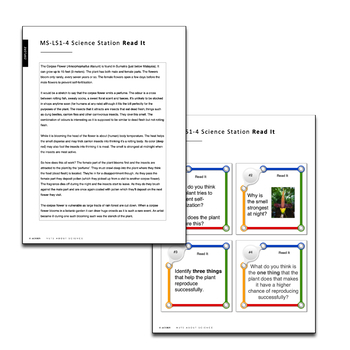 Over 40 pages of student activities, questions and notes complete and compliment this engaging resource which comes already differentiated for your students. Watch It – This is a great video that is sure to engage your students. Read It – at this station the students will read about the Corpse Flower. Be prepared for some of them to be grossed out. Research It – here the students use a computer/browser and navigate to a reliable news source where they learn about new research on how plants use scent patterns to guide bees towards nectar. Infer It [plant] – students read a sheet showing photos and descriptions of various plants. They must infer from the photos how the plant is adapted for successful reproduction. 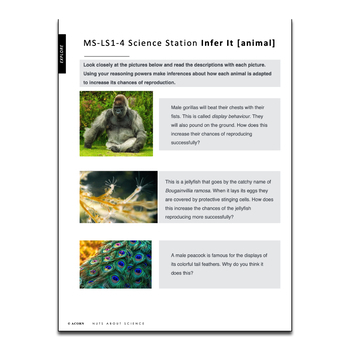 Infer It [animal] – student read a sheet showing photos and descriptions of various animals. They must infer from the photos how the animal is adapted for successful reproduction. Illustrate It – this station allows the students to use their imagination. They can either design a wind pollinated or animal pollinated plant. The students must justify their decisions. NGSS and Next Generation Science Standards are a registered trademark of Achieve. Neither Achieve nor the lead states and partners that developed the Next Generation Science Standards was involved in the production of, and does not endorse, this product.